Your car's performance exhaust system needs to be working correctly to keep your car in top operating condition. Performance exhaust systems, whether they are aftermarket exhaust systems, custom exhaust systems or stock systems, help your vehicle in a variety of different ways. The exhaust system creates a more enjoyable driving experience by quieting the engine noise. It also reduces air pollution by controlling the emissions your vehicle releases. Having a properly operating catalytic converter is crucial to ensure that the exhaust system does not have leaks. 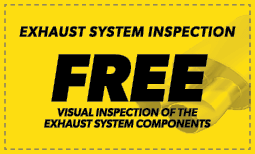 Visit your local Meineke #2281 in Albuquerque, NM, today for more information about maintaining high-performance exhaust systems. Exhaust systems experience a lot of wear and can develop leaks and cracks. Keeping track of the state of your muffler is important to your car's function and your safety. If you want your car to run smoothly and protect you from carbon monoxide poisoning, check on your car muffler. If your average miles per gallon are going down, the car is sounding louder, or a bad odor is coming from the car, you should stop by a muffler shop to get it repaired or have it replaced with a performance exhaust system. We'll perform all inspections, maintenance, and replacements needed at Meineke #2281 in Albuquerque, NM. A high-performance exhaust system for your car plays an essential role in the proper operation of the vehicle. When your car engine runs, fuel combustion naturally creates harmful gases. The performance exhaust system expels those gases from the car and keeps them from entering the interior. It also controls the emissions and amount of pollution released into the air while quieting engine sounds. It is important to fix a leak in high-performance exhaust systems as soon as it is detected because leaks can affect your car's performance. Visit your local in Albuquerque, NM, to have your exhaust system checked out. Many drivers make the decision to get high performance exhaust systems. There are several upsides to getting an aftermarket exhaust system installed on your car. The main benefit is that they allow exhaust gases to be released more efficiently, which means more power goes to the engine. Another enjoyable aspect of custom exhaust systems is a more aggressive and deeper tone. Anyone can get a new performance exhaust system installed, but it can be an especially helpful investment for those who are already in the market for muffler repairs. Bring your car to Meineke #2281 in Albuquerque, NM, for any repairs or replacements you need for your exhaust system. Once you learn that a new exhaust system is necessary to repair your vehicle, you may be wondering where to find the best muffler shop in Albuquerque, NM. We have many locations available for you to choose from so you can get the performance exhaust system you need at a time and in a location that is easy and convenient for you. At Meineke #2281, we understand that muffler repair cost is one of the biggest concerns on your mind. Fortunately, our technicians are committed to giving you the best service possible to make your aftermarket exhaust repair experience a great one. Stop by today to learn how we can improve your ride’s performance with one of our affordable custom exhaust systems.